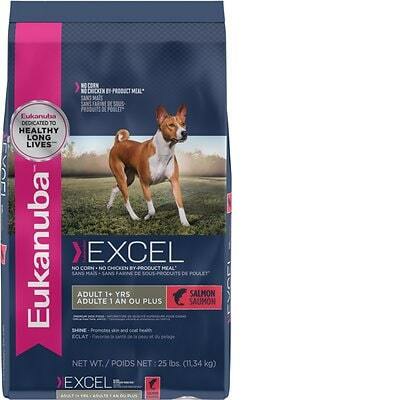 Eukanuba Excel Adult Salmon Formula is a low-priced dry dog food with overall lower quality. This product has 2 controversial ingredients but includes no artificial preservatives, colors and flavors. The food has a high amount of carbs, compared to its protein and fat and also only mixed meat and fat quality. 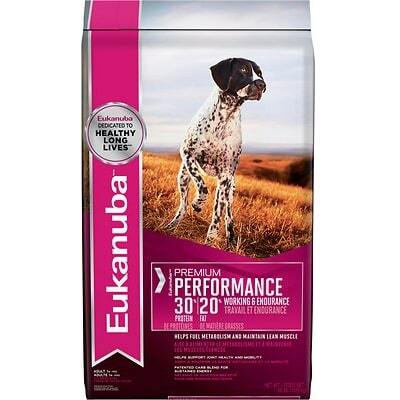 Moreover, Eukanuba has an above-average number of recalls. However, the company was very open when answering our transparency questions. Salmon, Brewers Rice, Ground Whole Grain Sorghum, Potato, Ground Whole Grain Barley, Chicken Meal, Fish Meal (Source of Fish Oil), Chicken Fat (Preserved with Mixed Tocopherols, a Source of Vitamin E), Dried Egg Product, Dried Beet Pulp, Natural Flavor, Brewers Dried Yeast, Potassium Chloride, Salt, Sodium Hexametaphosphate, Fructooligosaccharides, Calcium Carbonate, Dl-Methionine, Choline Chloride, Minerals (Ferrous Sulfate, Zinc Oxide, Manganese Sulfate, Copper sulfate, Manganous Oxide, Potassium Iodide, Cobalt Carbonate), Vitamins (Ascorbic Acid, Vitamin A Acetate, Calcium Pantothenate, Biotin, Thiamine Mononitrate (Source of Vitamin B1), Vitamin B12 Supplement, Niacin, Riboflavin Supplement (Source of Vitamin B2), Inositol, Pyridoxine Hydrochloride (Source of Vitamin B6), Vitamin D3 Supplement, Folic Acid), Vitamin E Supplement, L-Carnitine, Beta-Carotene, Rosemary Extract. The average dog food we reviewed has 39 total ingredients, with 1 controversial ingredient. This product has 2 total controversial ingredients and 1 of them are found in the first five ingredients. This is concerning because the first 5 ingredients make up most of the product. Fish meals are made by cooking fish. Water is removed from meats to create a protein-rich meal powder. Meat meals contain about four times the protein meats do, so generally, they're a good source of nutrients. While fish is generally nutritious, this ingredient doesn't identify the species it comes from making it questionable and intransparent. This includes the potential that rancid, dead, dying, disabled or diseased meat sources could have been used. For that reason, we do not consider this a high-quality ingredient. With one exception the meat and fat quality of this product is good. Three of the animal-based ingredients, Salmon, Chicken Meal, and Dried Egg Product, identify the species they come from which is very important. However, “Fish Meal” does not make it clear what fish is used. Missing information on meat sources is not a sign of quality in dog food. But it's a good sign that Eukanuba includes Chicken Fat, a named fat source. 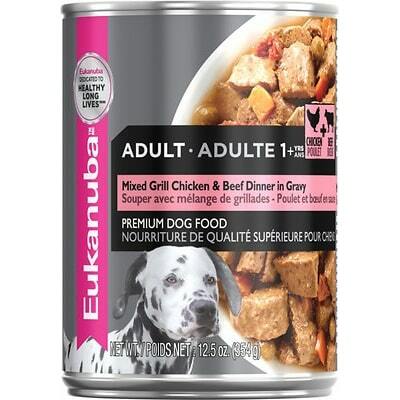 Eukanuba does not use controversial preservatives in this product. It’s important to know that ‍not all artificial preservatives are bad. They place an important role in preventing food from spoiling to extend a products shelf life. However, we consider 11 artificial preservatives controversial because of their potential link to cancer and other serious health conditions. This product is free of artificial colors. This product is also free of artificial flavors.